Phil Hill, the first American driver to win the Formula 1 World Championship, has died at the age of 81. Hill, who had been suffering from Parkinson's disease, died early on Thursday at the Community Hospital of the Monterey Peninsula in California. Philip Toll Hill was born in Miami, Florida on April 20, 1927, but he soon moved with his family to Santa Monica, where his father was the postmaster. He drove his first car at nine and at 12 an aunt bought him a Model T Ford which he was able to take apart and reassemble endlessly and drive on private roads in Santa Monica Canyon. He was too young to serve in World War II and in 1945 went to the University of Southern California to study business administration. In his spare time he worked as a mechanic and salesman at Roger Barlow's International Motors, which was the largest foreign car dealership in Los Angeles at the time, selling European sports cars to the Americans. One of his fellow salesmen was Bernard Cahier and the chief mechanic was Ritchie Ginther. The culture was one of racing and Hill was soon involved, competing in races at makeshift tracks across California in the early 1950s. In 1946 he was one of the first members of the California Sportscar Club and in 1948 he won his first race at Carrell Speedway, in the San Fernando Valley, in an MG TC. He dropped out of school and in 1949 went to England where he worked at Jaguar and took an XK120 back to the United States with him and won in 1950 at Pebble Beach. Both his parents died soon afterwards and in 1951 he bought a Ferrari sports car and began to enjoy better results. His career was slow to develop, not helped by Hill's ill-health and natural reticence, but in 1955 he was given the chance to drive for Ferrari at Le Mans, sharing a factory car with Umberto Maglioli. His initial success came in sports cars. He won the Sebring 12 Hours in 1958 and then went on to win Le Mans 24 Hours in June that year with Olivier Gendebien. A few weeks later he made his Formula 1 debut at the wheel of a Jo Bonnier's Maserati 250F at the French GP. The death of Luigi Musso in the same event opened the way for him to race an F1 Ferrari in Germany, where disaster struck the Italian team for a second time, with the death of Peter Collins. At the Italian GP Hill finished third, just behind team leader Mike Hawthorn. In Morocco he played an important role in winning Hawthorn the World Championship when he slowed and waved the English driver through into second place. When Hawthorn announced his decision to retire, Hill became a regular Ferrari F1 racer, finishing fourth in the World Championship in 1959. He he did not win his first Grand Prix until the Italian GP at Monza in 1960 and in the course of 1961 he emerged as a World Championship challenger, alongside his team-mate Wolfgang Von Trips. 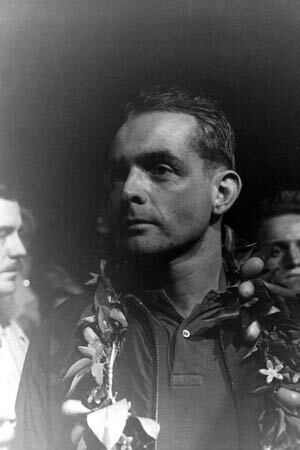 That summer he won Le Mans again for Ferrari and at Monza sealed the World Championship when Von Trips crashed and was killed after a collision with Jim Clark. He won Le Mans again (once more with Gendebien) in 1962, but at the end of the year he quit Ferrari, which was falling apart at the time, and joined a renegade group of Ferrari engineers at ATS. This was a bad mistake as the team was never competitive. He raced for Cooper in 1964 but then dropped out of the F1 scene and spent several years racing for Ford and then Chaparral in the United States. His last major win came in 1967 when he won the BOAC 500 at Brands Hatch in England. He was 39. After he retired from the sport he established a classic car restoration business with Ken Vaughn in the 1970s. He also did occasional work as a TV commentator for ABC and writing articles for Road & Track magazine. His son Derek raced in Formula 3000 in 2001, 2002 and 2003. He is survived by his wife Alma, his son, daughter Vanessa, stepdaughter Jennifer and four grandchildren. "Personally I am deeply saddened," said Ferrari president Luca di Montezemolo, "as is everyone at Ferrari. He was a man and a champion who gave a lot for Ferrari and who has always represented our values both on and off the race track. Phil Hill drove for us and won many races both in our sports prototype cars, in events such as the Le Mans 24 Hours and in our single-seater with which he became the first American to win the Formula 1 World Championship. We often kept in touch over the past years and I will miss his passion and his love of Ferrari."